Fans of Geylang United would have to take some time to get used to see their beloved Eagles trooped out Bedok tunnel in not their usual green outfit. Instead of the colour that was long associated with the most successful team in the pre S.League days, the players will be donned in maroon top. "We have always been green, why change our identity?" said web designer Md Noor Hadi, an Eagles supporter who was surprised with the club's decision that was made known recently. He added:"It may be a small matter to many, but to people like me, who supported the club since early 90s (Geylang International days), it's just not right lah. Green is the club colour, not maroon." Similar sentiment is not alone with a Geylang fan voiced his disapproval on the club's official facebook page when the new maroon home kit was first unveiled. The unveiling of the unpopular colour came at a time when the club recently launched its latest club merchandise - a scarf with a colour combo of white and ironically, green. "It's weird to see fans with green scarves supporting team wearing maroon." 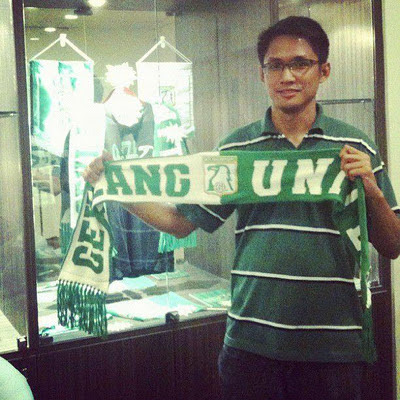 exclaimed Hadi who recently got himself the new scarf at the club office (pictured above). In the email response to the queries of the colour change, Geylang United said:"(The club) has always been associated with the colour green since its establishment in 1974. "However, the club decided to have a different look for 2012 hence the decision to change the home kit to maroon which consultation being sought and agreed upon from both club management and the S.League." In the same statement, the two-time league champions said they are well aware of the fans' reaction and added:"We really appreciate the fans' concern and had taken their suggestions and comments into consideration before concluded the decision." While over at the other end of the island, Tanjong Pagar United, however, is reverting back to its roots when it announced the upcoming season will see the Jaguars parade in its traditional red-white horizontal stripes home kit (pictured below). "I feel delighted because I always felt that clubs should always wear their original colours they begin with." 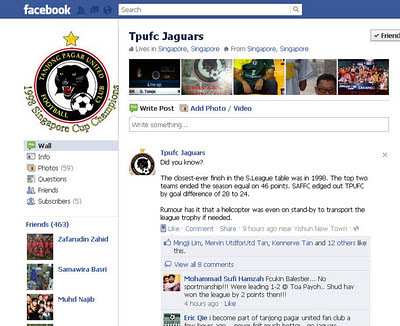 said long time Jaguars fan Gavin James Perreira in welcoming the club's decision to revert to its original colours. He added:"The traditional red and white stripes are the ones I think most Jaguars' fans of the old and new generation can identify with as they are the starting colours when the S.League first started in 1996." It was probably such a consensus among other supporters that the club had gathered from their various feedback channels that they decided to proceed with the plan of the colour switch when it was mooted in middle of last season. "In mid-2011, we commenced planning for 2012, part of the plan was to bring the traditions of the Club, including the Red-and-White and Gold-and-Black stripes." explained the club in a statement on the come-about of the idea. "We have also gathered feedback from some of the Club fans on the proposal, most of whom would like to see the team back in the traditional stripes. "The reasons behind the switch to the traditional "Red-and-White" stripes are two-fold - for one is to re-emphasize the traditions of the Club and two, to lure the fans back to the Club, most of whom are able to associate themselves with the "Red-and-White" stripes." said the club in the same statement in respond to queries from this blog. 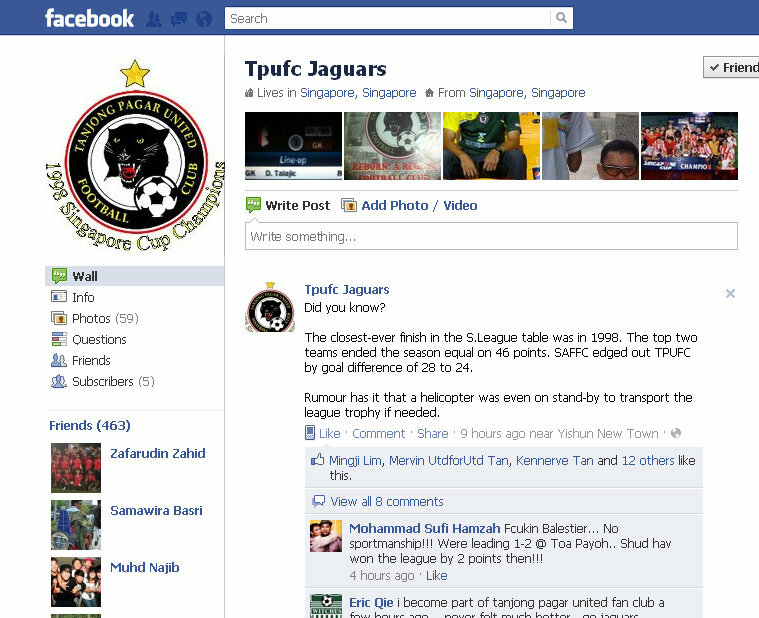 As the result, the design of the 2012 home kits for the Clementi-based club was finalized by their apparel sponsors, THORB at the end of last season when it was unveiled officially at the Jaguars' last home match against Hougang United. The club hopes that with the switch it will help to reconnect its traditional catchment area at Tanjong Pagar GRC, and at the meantime strengthen its presence in areas such as Clementi, West Coast, Ayer Rajah, Queenstown and Radin Mas being the regional sole professional football club. Green to red? Almost like Lions wearing yellow and black stripes. It is illogical decision like this that typifies the perception of S.League management and why fans choose not to waste time supporting them.